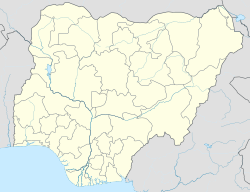 The Idoani Confederacy is a traditional state based in the town of Idoani in the Ose Local Government Area of Ondo State, Nigeria. The origins of the state date back at least to 15th century, when the Oba Ozolua "the Conqueror" (c. 1481–1504) fathered the Alani of Idoani, which he made a vassal state of the Benin Empire. The present confederacy, which dates to 1880, includes six eastern Yoruba communes: Ido, Amusigbo, Isure, Iyayu, Isewa and Ako. Some of these had two concurrent rulers in the past. The communities that formed the confederacy had suffered during the 19th century wars, with many people migrating to other areas. During the struggle with the combined forces of Ijesha and Ekiti in 1879 they were forced to ask for help from Ibadan, and formed the confederacy the next year. British missionaries introduced Christianity in the late 19th century, along with new farming methods, and Idoani became part of the Lagos colony, later the protectorate of Nigeria. The communities were merged in 1921. The first confederate traditional ruler was appointed after the death of Alani Adesunloye Atewogboye on 3 January 1921. Falade I ruled as Alani from 1921 to 1958, and was succeeded by Akingboye Falade II on his death. In the early 1970s, Akingboye Falade II died and a temporary regent was installed by the traditional authorities, who ended up ruling for 14 years due to a dispute between the chiefs and the government over the succession process. The military government then installed an Alani of their choice in the traditional ruler's palace, who was accepted by some but not all of the chiefs. When the civilian Bamidele Olumilua became governor (1992–1993) he imposed traditional law, and Oba Aderemi Atewogboye was elected. However, the usurper remained in the palace, and the town was divided between the two. After the return to military rule, the Administrator of Ondo State from August 1996 to August 1998, Anthony Onyearugbulem, presented the staff of office to the rival Alani of Idoani, a person said by some to have no royal blood. With the return to civilian government in 1999, Aderemi Atewogboye was recognized as the ruler. He continues to perform duties such as intervening in family disputes or cases of violence against women. In April 2009 he led a delegation of several hundred people from the Ose community to protest against delays in ratifying that area's designate for a commissioner in the state government. In 2009 Atewogboye called on the government to improve the roads, which had suffered years of neglect and were impassable at some times of the year. ^ Jacob Obafẹmi Kẹhinde Olupọna (2004). Beyond primitivism: indigenous religious traditions and modernity. Routledge. p. 185. ISBN 0-415-27320-X. Retrieved 6 October 2010. ^ a b Ozolua Uhakheme. "Idoani: One community, many tongues". Art-Life. Retrieved 6 October 2010. ^ a b Ozolua Uhakheme (17 February 2010). "Idoani: One community, many tongues". The Nation. Retrieved 6 October 2010. ^ "Traditional States of Nigeria". Worldstatesment.org. Retrieved 6 October 2010. ^ a b B.A. Adeladun (9 December 2003). "Wages of injustice (II)". BNW News. Retrieved 6 October 2010. ^ Funso Muraina (20 April 2001). "Adefarati: Not Yet Dancing Time". ThisDay. Archived from the original on 12 September 2005. Retrieved 6 October 2010. ^ Miriam C. Menkiti (23–26 October 2005). "Domestic Violence Against Women – A Story of Community Prevention Strategies from Two States in Nigeria: Enugu and Ondo" (PDF). Women Information Network. Retrieved 6 October 2010. ^ "Community rises for Ondo commissioner-designate". The Nation. 17 April 2009. Retrieved 6 October 2010. ^ Babatope Okeowo (18 August 2009). "Monarch appeals to FG on roads". Nigerian Compass. Retrieved 6 October 2010. This page was last edited on 21 October 2018, at 23:05 (UTC).